Tempted by an offer by Ferrari 1970, to keep him in the Sports car team Porsche paid his drive with STP March team. At the seaon's finale race, The Rothams Victory race a suspension failure sent the BRM P160 hurtling into a bank, the car bursting into flames. 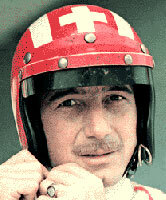 Siffert was trapped in the wreckage and when he was finally extricated was found to have died of asphyxia, having survived the initial impact with a broken leg.